The poet Stephen Spender once defined wit as “the ability to discover amusing analogies between apparently unrelated things and express them clearly.” As I was contemplating the late Dina Wind’s more than 20 sculptures from the 1980s and 1990s in the exhibition Dina Wind: Transformations, on view at Bridgette Mayer Gallery through Feb. 28, I was struck by the wittiness of her work, which is not “amusing” in a conventional sense, but in its ability to jolt the observer into a novel perception of incongruity. For me, the sculpture that best exemplifies this is “Still Life with Pitcher #1” (2000), which boldly takes on the tradition of still-life painting and reinvents it. The fact that Wind was born in Israel and served in the Israel Defense Force may have fostered the affinity for machinery and mechanical objects that pervades her work. 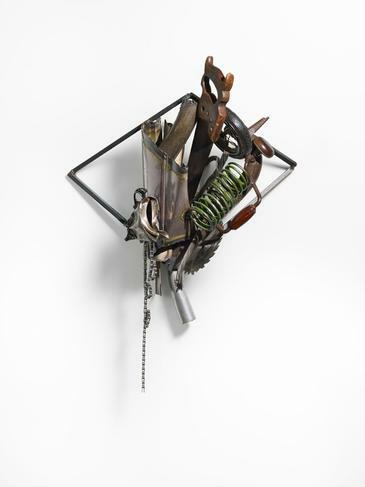 The materials and technique she uses are “masculine” and unconventional–found objects that consist of such unlikely components as scrap metal, tools, car parts, and mechanical devices welded together to form assemblages. In “Still Life,” we find a spring, a bicycle chain, a saw, part of a smashed fender, cable wire, a shopping cart wheel, and a hand drill. A wall sculpture, the piece is set at an angle inside a steel frame behind it, and in a further poke at tradition, it breaks the steel frame’s boundaries. The incongruity of the materials and the composition suggest parody, even iconoclasm, but clearly there is a deeper message here. Wind is challenging the genre of still-life painting and expressing its artistic principles in a visual idiom of our time to “make it new”. The abstract, asymmetrical composition, enhanced by the subtle play of color and texture, is infused with energy, to the extent that the inanimate parts seem animated, anything but still. They radiate a singular beauty, recapitulating a bowl of fruit, a wedge of cheese, a dead fish, and a bouquet of flowers. The inclusion of a smashed 19th-century pewter pitcher at the base is an homage to the continuity of tradition, even while the sculpture subverts it. In this exhibition, Wind uses similar materials to execute other witty interpretations of subjects, ranging from a school of barracudas to opera brooches. Dina Wind: Transformations is on view at Bridgette Mayer Gallery, Vault Space and Lower Level Gallery, until Feb. 28, 2015.